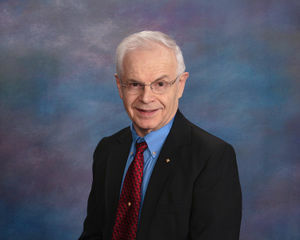 John R. Vig, IEEE President, 2009, led research and development programs focused on developing precision clocks, sensors, and low-noise oscillators in the U.S. Army Research Laboratory. John Vig was born in Budapest, Hungary. When he was two years old, most of his relatives were deported to concentration camps. His father survived the camp at Buchenwald, Germany, but 14 other close relatives were murdered in Auschwitz and in other camps; including his grandmother, aunts, uncles, and cousins. After the Communists took over Hungary, they nationalized his father’s business and the family apartment. They labeled the family as “capitalists” and, therefore, “enemies of the people.” They jailed his father for 1½ years, and then deported the family to Hunya, a small, undeveloped farming community in Eastern Hungary from which the family was not allowed to leave without formal government permission. The family escaped Hungary during the revolution of 1956; entered the USA, as refugees, in 1957 (when John was 14 years old), and settled in New York City. He received the B.S. degree from City College New York, in 1964; and the Ph.D. in Physics from Rutgers - The State University, New Brunswick, NJ, USA, in 1969. Upon graduation he joined the Electronic Components Laboratory at Fort Monmouth, NJ, USA. Throughout his professional career, working as a physicist, electronics engineer and program manager, he performed and led research aimed at developing high-accuracy clocks, sensors and low-noise oscillators. He retired in 2006 but continued working as a technical consultant, primarily to Defense Advanced Research Projects Agency (DARPA) program managers. The research programs he supported ranged from micro/nano resonators to low-noise oscillators and chip-scale atomic clocks. He remained active in IEEE after his term as president ended. He was elected VP, Publications, of both the Sensors Council and of the UFFC-S; served on the MGA Nominations and Appointments Committee; on the Conferences Publications Committee; as General Co-Chair of IEEE SENSORS 2012; and in other positions. In 2012, the UFFC-S AdCom elected him to be an AdCom Member Emeritus, for life. John Vig has been awarded 54 patents, has published more than 100 papers and nine book chapters, and his publications have been cited more than 2000 times. He has served for more than 40 years as a volunteer in his home area; as an Environmental Commissioner of Colts Neck, NJ, as a member of the Monmouth County Environmental Council and as a trustee of the Colts Neck Friends of the Library. He and his wife of 53 years are avid ballroom dancers. In 1988, he was elected Fellow of the IEEE "for contributions to the technology of quartz crystals for precision frequency control and timing."